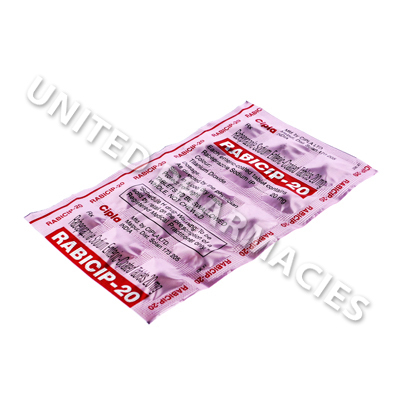 Rabicip (Rabeprazole Sodium) works by inhibiting the proton pumps in the stomach, the overall result of which is a significant reduction in the volume of gastric acid produced. Rabicip (Rabeprazole Sodium) works by inhibiting the proton pumps in the stomach, the overall result of which is a significant reduction in the volume of gastric acid produced. This helps to treat a peptic ulcer (which can develop as a result of large amounts of stomach acid) and can also relieve symptoms of reflux oesophagitis, a condition that causes stomach acid to flow backwards into the oesophagus, often resulting in a painful sensation and indigestion. Lowering gastric acid production can also allow the stomach and oesophagus to heal if it has been damaged. 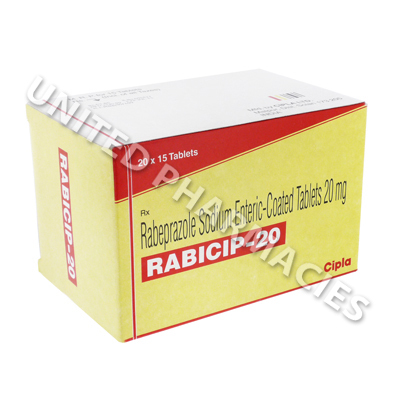 Rabicip (Rabeprazole Sodium) comes as sodium enteric coated tablets containing 20mg of the active ingredient. The dosage schedule will be decided upon by your doctor, and the main factors taken into consideration will be the condition in need of treatment and its severity. Adults treating a duodenal ulcer might be told by their doctor to take 20mg per day, administered after breakfast. Treatment may last for 4 weeks, however certain patients may need to continue taking it beyond this in order for the ulcer to heal. Your doctor will wish to be kept up to date on your condition, and any side effects that occur will need to be reported. Taking this medicine could possibly lead to reactions which are much more serious in nature to those listed above, and may significantly affect the patient's health. You must immediately go to the doctor if you notice blisters on the skin, muscular spasms, seizures, bloody diarrhoea, fever or any other reactions which are not listed here. Medicines which affect the proton pumps in the stomach like this one (called proton pump inhibitors) have been associated with increasing the chances of broken bones in certain cases. If treatment with this medicine is on a long term basis, the risk is higher. This medicine reduces stomach acidity and might place the patient at risk of stomach infections. Ask your doctor about this before starting treatment. Always use Rabicip (Rabeprazole Sodium) as you have been prescribed by your doctor. Never self-medicate or change your dosage without first consulting your doctor. The correct dosage can vary depending on your health, medical history, and the severity of the condition being treated.